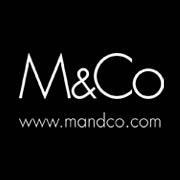 "Don't miss out on the exclusive M&Co Loyalty event! 25% OFF full price & free world wide delivery* until Sunday 2nd December." "Get 30% off all full price lines with Code BLACK30 Shop: http://bit.ly/2qYudUg"
"Get 30% all full price From Thursday 22nd November - Friday 23rd November: http://bit.ly/2qYudUg"
"Take a look behind the scenes of the brand new autumn/winter 2018 M&Co TV advert. #CaptureTheLook Shop the ad looks here: http://bit.ly/2NObB1Y"
"Sparkle season has arrived and so has the Autumn/Winter 2018 M&Co TV advert! #CaptureTheLook Whether you're planning the perfect party look for Christmas or simply want to..."